This management agreement form is designed to document the business relationship between a single physician with a medical practice and a medical practice manager. The manager's fee is calculated as a percentage of the doctor's gross monthly revenues. The receipts from the medical practice are deposited into an operational account, and twice a month the manager will prepare a check for itself (the manager's fee) and for the physician representing the balance of the collected monthly receipts. The term of the agreement is one year, however, the agreement provides for annual automatic renewals unless either party terminates with ninety days notice to the other party prior to the end of the existing term. 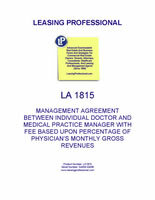 The agreement specifies the authority and responsibilities of the practice manager for the administration and business management of the medical practice, which include arranging for equipment, supplies, non-physician personnel, provision of office space, financial record keeping, and patient billing and collection, among other duties. The physician is responsible for the practice of medicine under the agreement, since substantially all of the business aspects of managing the practice are performed by the management company. The physician is also responsible for providing other physicians and other licensed healthcare professionals for the office if desired. THIS MEDICAL PRACTICE MANAGEMENT SERVICES AGREEMENT (the "Agreement") is made and entered into effective as of __________, 20__, by and between __________, a ___________ limited liability company ("Manager") and _________, an individual ("Physician"). A. Physician is licensed to practice medicine in the State of ___________ ("State"). B. Manager is a company specializing in providing management services to healthcare professionals, and is experienced in providing management services to practices of the type operated by Physician. C. Physician desires to provide medical services at the "Practice Site," as such term is defined below, and Manager and Physician desire that Manager provide management services to Physician on the terms and conditions contained in this Agreement. 1. Relationship of Physician and Manager. a. Appointment of Manager. Physician hereby appoints Manager as the exclusive manager of Physician's medical practice (the "Practice") at the "Practice Site," as such term is defined in Section 2.e. below, and at any other Practice Sites at which Physician provides or supervises medical services, and Manager shall provide to Physician the technical, management, administrative and support services and equipment described in Section 2 below. b. Retention of Authority and Control. Notwithstanding the authority granted to Manager in this Agreement, Manager and Physician agree that Physician shall at all times exercise overall control of the operations of the Practice, and shall retain legal responsibility for all professional medical and ethical matters in connection with the Practice. Manager's duties for Physician under this Agreement shall be purely non-medical and administrative in nature, and Manager shall in no way exercise any clinical judgment as to the nature of professional or ancillary services or type of practitioner that any patient requires or receives. Rather, Physician shall be solely responsible for and have complete authority, supervision and control over the provision of professional healthcare services performed by Physician and the "Licensed Health Professionals," as such term is defined below in Section 2.b.iv., as Physician, in his sole discretion, deems appropriate and in accordance with all applicable laws and regulations. This Agreement shall in no way be construed to mean or suggest that Manager is engaged, or permitted to engage, in the practice of medicine. Any delegation of authority by Physician to Manager that would require or permit Manager to engage in the practice of medicine shall be prohibited and deemed ineffective and Physician shall retain and have sole authority at all times with respect to all such matters. a. Day-to-Day Management. Physician hereby engages Manager as his sole and exclusive agent to manage and administer the day-to-day business functions related to the Practice conducted by Physician at the Practice Site. Manager's performance of the Services shall involve such expenditure of time as Manager determines is necessary or advisable in its reasonable discretion. i. Manager shall employ or engage and provide to Physician all administrative personnel, including a receptionist, secretarial and transcribing personnel, billing personnel, purchasing personnel, janitorial and maintenance personnel, and such other administrative and management personnel that Manager determines to be necessary or appropriate, after consultation with Physician, for the efficient and proper operation of Physician's Practice. All such administrative and non-licensed personnel engaged by Manager shall be referred to collectively as the "Support Personnel." ii. Manager shall be responsible for the hiring, supervising, training, disciplining, and termination of the Support Personnel, including all determinations regarding the retention, promotion, demotion, awarding of bonuses, salary adjustments and other matters affecting the terms and conditions of the employment or engagement of the Support Personnel in accordance with and subject to such personnel policies as may be adopted from time to time by Manager. Staffing levels, work hours and shifts and employee benefit programs shall be established and implemented by Manager in accordance with the policies and funding arrangements developed by Manager. iii. Manager shall be responsible for compensating the Support Personnel, and shall provide payroll accounting services and maintain employee records, workers' compensation insurance, unemployment insurance, and such employee benefit programs for the Support Personnel as it determines are necessary or advisable in its sole discretion. iv. Physician shall be responsible for employing or engaging, at Physician's sole cost and expense, additional physicians or licensed allied health professionals, including but not limited to Registered Nurses and/or Physician Assistants (collectively, the "Licensed Health Professionals"), which Physician shall supervise in accordance with all applicable laws and regulations. If Physician engages Licensed Health Professionals, Manager shall administer the payment of compensation of the Licensed Health Professionals, including providing payroll and accounting services, preparing checks for the signature of Physician and maintaining employee records. Manager shall also administer the payment of all applicable vacation pay, sick leave, and retirement, health and life insurance benefits provided by Physician, at Physician's sole cost and expense, to the Licensed Health Professionals. i. Manager shall provide all billing and collection services that Manager determines to be necessary or appropriate in connection with the charges resulting from the performance of services by Physician and the Licensed Health Professionals. Specifically, Manager shall prepare patient invoices; input billing information; prepare computerized billing statements and submit bills and claims to patients and third party payors; respond to telephone inquiries from patients and payors concerning their bills; diligently pursue collection of unpaid bills for up to one hundred eighty (180) days from the initial billing, and, thereafter; refer such unpaid bills to collection agencies or attorneys for collection, the cost and expense of which shall be borne solely by Physician. Manager shall deposit all payments into the "Operational Account" described in Section 3 below. Manager shall provide monthly and year-to-date reports showing all billings, collections, and accounts receivable and the aging of same. 1. To bill in Physician's name and on his behalf: (a) patients; (b) third party payors and (c) any other persons or entities who are obligated to pay for services performed by Physician and the Licensed Health Professionals. 2. To collect in the name of Physician and on his behalf all charges, fees or other amounts resulting from or related to the professional and ancillary services performed by Physician and the Licensed Health Professionals. 3. To receive all payments arising from the professional and ancillary services performed by Physician and the Licensed Health Professionals; take possession of and endorse in the name of Physician all cash, notes, checks, money orders, insurance payments and any other instruments received as payments of accounts receivable of Physician, however arising. Physician shall immediately forward to Manager any such payments that may come into the possession of Physician or the Licensed Health Professionals. Physician hereby expressly authorizes and grants Manager the right to open any mail or messengered envelopes or packages sent by any Practice patient or third party payor which lists Physician or any Licensed Health Professional as the addressee. Physician agrees that he shall not attempt to stop, hinder, interfere with, re-direct or divert any claims, payments or explanation of benefits, whether submitted or paid in a written form, by facsimile or electronically, during the term of this Agreement or after its expiration. 4. To deposit all "Gross Revenues," as such term is defined in Section 3.a. below, directly into the Operational Account, in accordance with Section 3 below. iii. Physician acknowledges and agrees that Manager shall have discretion to compromise, settle or write off any amount due from a patient or third party payor, or determine not to appeal a denial by any third party payor of any claim for payment, for any particular professional service rendered by or on behalf of Physician. d. Supplies, Equipment, and Furniture. i. Manager shall be responsible for furnishing all management information systems (collectively, the "Management Information System"), office supplies, equipment, furnishings, furniture and personal property, including all telephones, postage and duplication services, stationery, forms and other items (collectively, the "Office Equipment") which Manager, after consultation with Physician, determines to be necessary or appropriate for the operation of Physician's Practice. Manager also shall be responsible for providing, either by purchase or by lease, such medical equipment (the "Medical Equipment") as Physician and Manager determine is necessary or appropriate for the operation of the Practice. ii. Manager shall arrange for the maintenance and repair of the Office Equipment and the Medical Equipment. If Manager determines, after consultation with Physician, that any item of existing the Office Equipment or Medical Equipment utilized in Physician's practice is worn out or obsolete and that it is unreasonable, impossible or economically impractical to repair, and if Manager, after consultation with Physician, further determines that such item is necessary or appropriate for the efficient operation of Physician's practice, then Manager shall purchase Office Equipment or Medical Equipment which is the same model or functional equivalent as the item of equipment to be replaced for use in the Practice.